British Railways fusee dial clock. 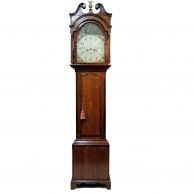 Mahogany case and eight inch diameter dial circa 1920. 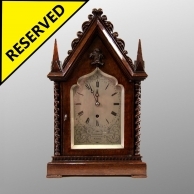 A good, clean and totally original example of a small L.M.R clock. The eight day duration, chain fusee movement with rectangular plates, large lenticular pendulum bob and Anchor Recoil escapement. 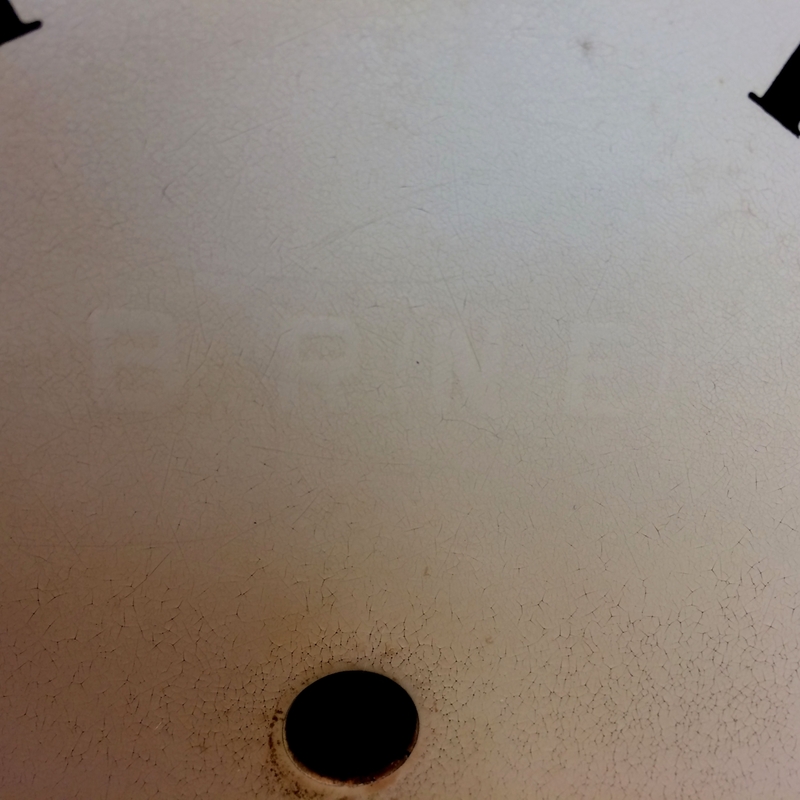 The backplate carries the serial number 7513. 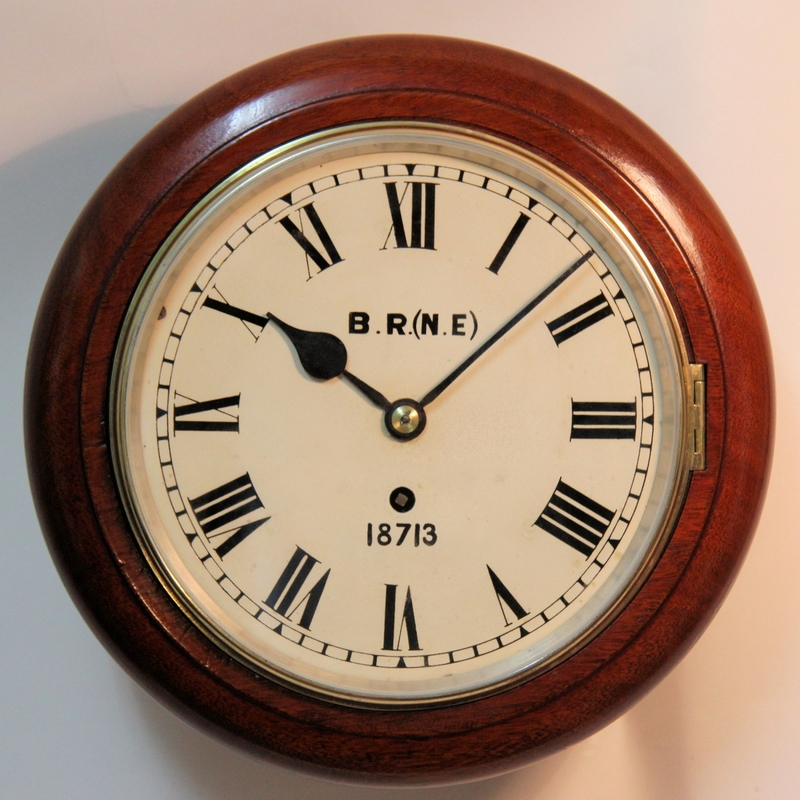 Behind an eight inch diameter, flat painted iron dial with black Roman numerals, minute ring and the railway marking "B.R. (N.E) 18713" to the middle. 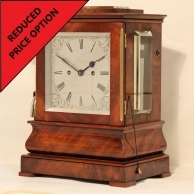 Contained in a solidly made, plain mahogany case with its original, glazed, polished and lacquered, cast brass hinged bezel with a silvered sight ring. Having a rounded bottom with a curved and cockbeaded locking door and also, side door. 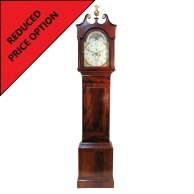 * These clocks have become very sought after in recent years. 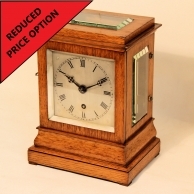 When British Rail was founded in 1948, most of the Railway Clocks were collected up from around the country and sent to their workshops in Doncaster. Dials, movements and cases we inter-changed to produce as many good, working clocks as possible. They were then numbered, had their dials re-written and then re-distributed across the country. Fortunately, this little example has kept all of its original components making it very collectable. 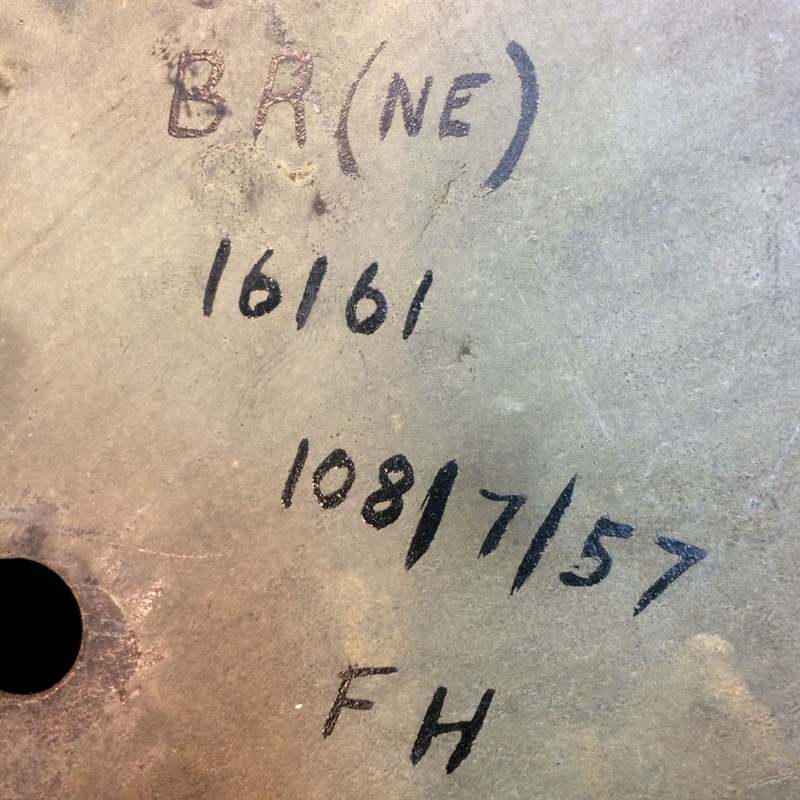 The original number '16161' is still clearly marked on the back of the dial and can be traced back to the Liverpool and Manchester Railway. Around 1948 it was re-assigned to British Rail, North Eastern Region: B.R. (N.E) and given the new number of '18713'. 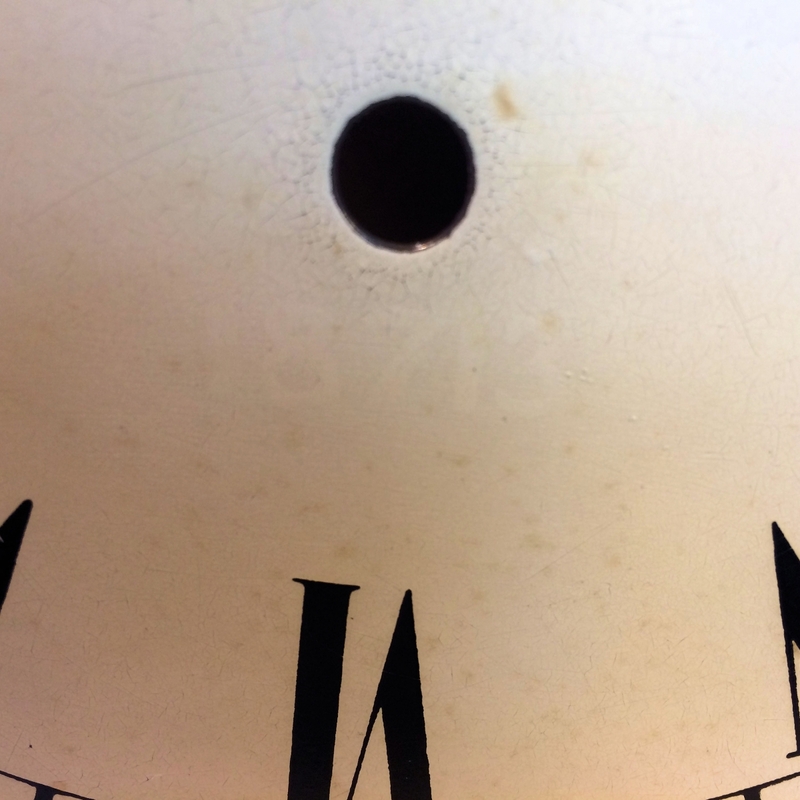 Eventually, it was sold off and the dial signing removed however, the photographs show that the shadow of them remained. They have now been re-applied. Dimensions: 11" wide x 6" deep. Condition: Excellent and totally original.